Interferons (IFNs) are members of the cytokine family of extracellular signalling proteins. There are 2 major types: alpha and beta IFNs (type I) act primarily to mediate resistance to viruses and as negative regulators of cell growth, whereas gamma IFN (type II) acts primarily to modulate immune responses within a complex network of other cytokines. However, the actions of the 2 types are not tightly confined, so that gamma IFN does have significant antiviral activity and alpha IFN has some role in immune modulation. Type I and type II IFNs have little homology and act through different cell surface receptors. However, recent work (see below) has revealed that there are common components in the signalling pathways through which the 2 types of IFN mediate their effects. For a recent general review of the IFNs, see Pestka et al. 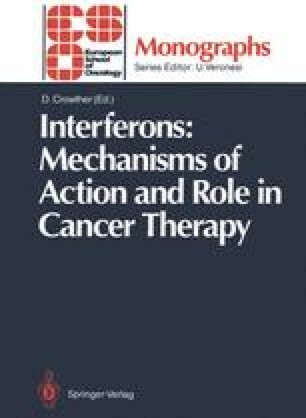 and for a comprehensive review of the role of IFN in treating human neoplasia, with several sections of background information, see Strander .